Snow camping can prove to be the ultimate adventure, but it is not for the faint of heart. If you’ve ever thought about snow camping, but weren’t sure where to start, we have some great snow camping tips for you. 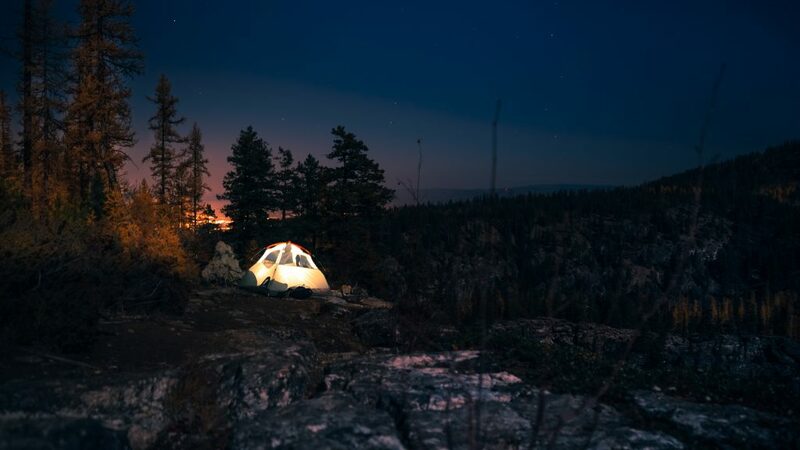 If you’ve never even considered this style of camping, you may just want to to try it, after you read this. We’re not just going to talk about how great it is though, we’ve also included the downsides and the risks. This article will equip you with a comprehensive breakdown of snow camping tips for freezing locations. 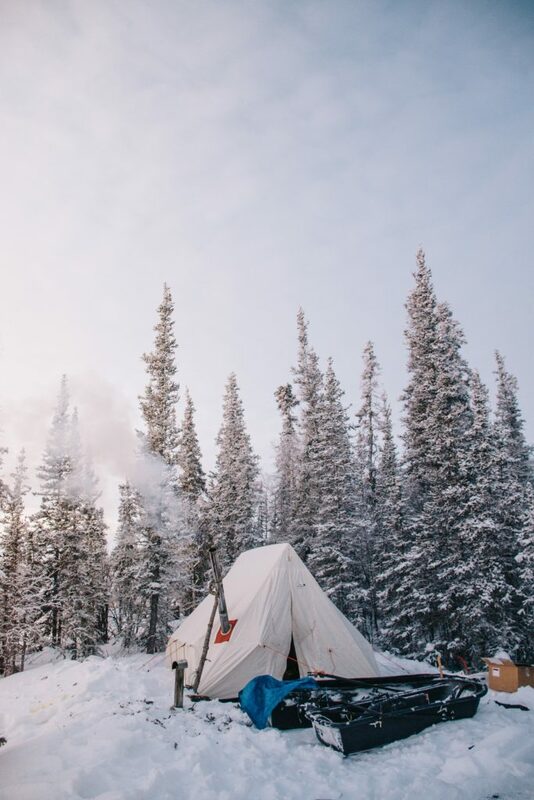 Snow camping, for the most part, is exactly what it sounds like – camping in the snow, complete with freezing temperatures. However, we’re not just talking about pitching a tent in your backyard with a few inches of snow on the ground. Although, that could be a good way to prepare yourself for the real thing. Real snow camping is camping out in the wilderness, the same way you’d camp in July, but with a few minor changes. For some, the thought of freezing temperatures and waist deep snow quickly ruins any chance that they’d actually want to try this. But, they’re missing out. Snow camping can be a lot of fun. I know you may be thinking, “What could possibly be fun about freezing in the snow?”. The thrill of doing it and getting to say you did it, of course. The same reason people participate in any activities that don’t really seem “fun” to others. Nothing feels better than succeeding at something you set out to do, even if other people don’t quite understand it. 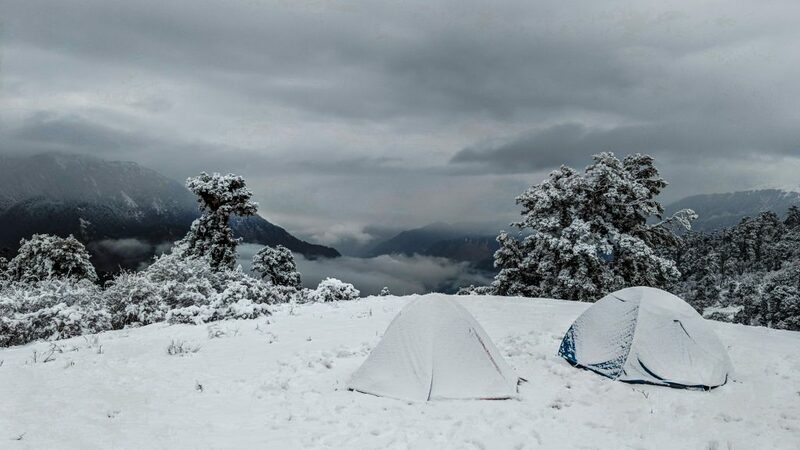 Snow camping can be considered an ultimate survival challenge. Anyone can spend a weekend in the woods when it’s 70 F plus degrees out. But, what about when it’s 15 F degrees, or colder, on open terrain, in the snow, in the mountains? That’s a real challenge. Snow camping is a test of character, willpower and endurance. 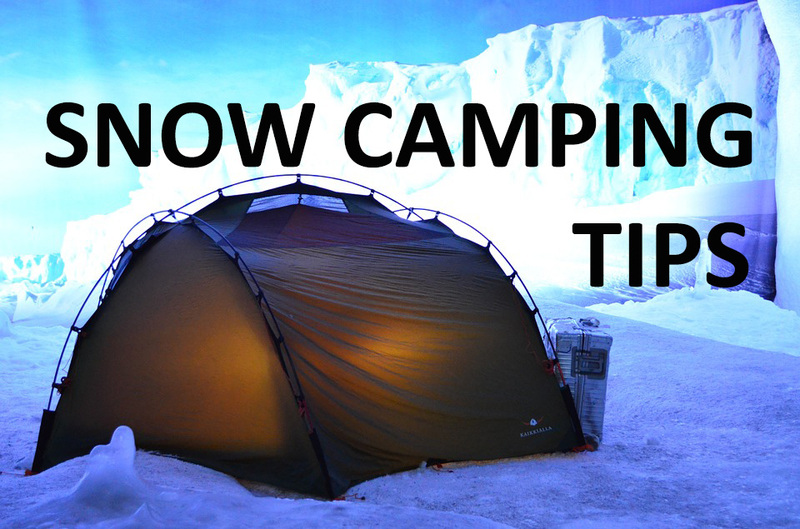 The following snow camping tips should give you everything you need for a successful trip. No crowds – Everyone goes camping in the warmer months and it can be hard to actually relax. What’s relaxing about noisy strangers 10 feet from you? If you go snow camping, chances are you’ll be the only one there. You won’t need a cooler – Coolers can be heavy and difficult to lug around, especially if your vehicle can’t go all the way to your campsite. Then there’s the hassle of having to run to the nearest store to restock on ice. In the winter, you don’t need a cooler per say. You can just set your beverages in the snow outside your tent door. There are no bugs – Everyone can appreciate a lack of bugs. The relentless swarms of mosquitoes and flies that can turn a peaceful summer night into a nightmare, they don’t exist in the winter. Snow camping makes you appreciate home – Some of us hate our houses, others don’t like our neighborhoods. But, nothing is sure to make you appreciate your home faster than a snow camping adventure will. The best climate for snow camping depends on how extreme you want to be. 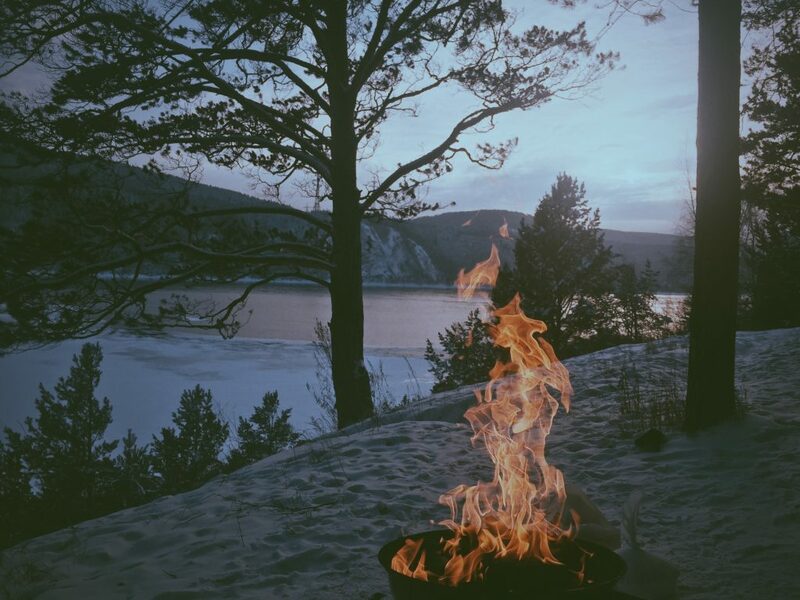 Most northern states can offer a decent winter camping experience. The general rule of thumb is the further north you go, the colder it gets and the more snow there is. 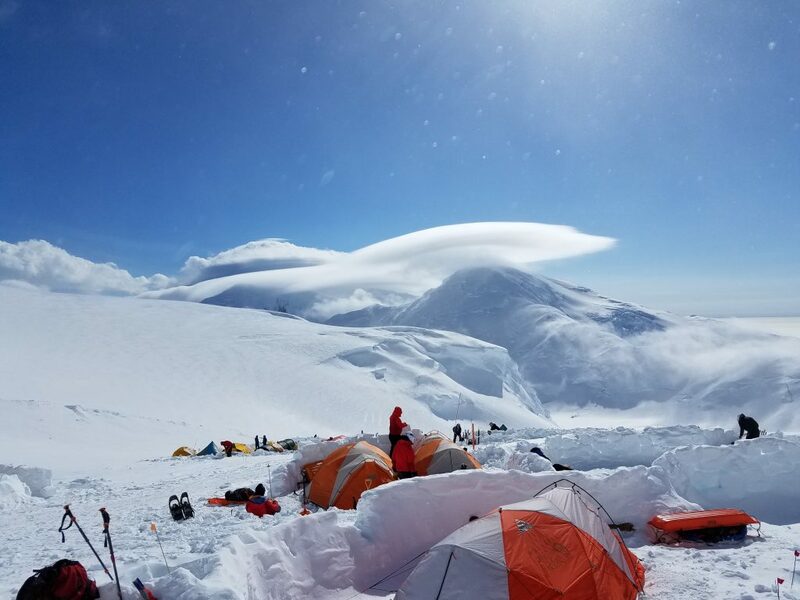 For instance, an experienced, diehard survivalist, snow camper may find Alaska an appealing challenge, while someone new to winter camping may find, that all the winter camping challenge they need, is in Oregon. National parks and forests definitely top our list of the best snow camping locations. Places like the Mt. Hood National Forest in Oregon, the Red Cliffs Campground in Utah, the Pictured Rocks National Lakeshore in Michigan and The Great Sand Dunes National Park in Colorado are some of our favorite snow camping destinations. 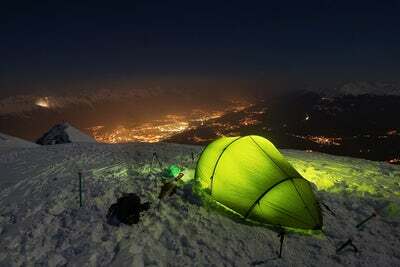 If you are in the UK Scotland, Northern England and Wales are your best locations for snow camping. These places offer more than just a few nights in a tent. You’ll also have the option to ski, snowboard, explore amazing places and see some of your nation’s greatest natural sights. There are some important things to know before you set out to go snow camping, there is also some mandatory planning that should be done. You don’t want to go snow camping without some kind of a plan. Planning is one of the most important parts of successfully snow camping. You should know where you’re camping, how long you’re camping and what the weather is supposed to be like, before you even start packing. Knowing the general location of where you’ll be camping can help you plan your campsite setup. It will also help you determine how exposed your site is, how much wind you should expect and if you’ll need extra tie downs for your tent. Weather is unpredictable and it can change in a short amount of time. A light snow storm can turn into a blizzard, especially in the mountains, but it still helps to have some idea of what to expect. Burned Areas – Recently several wildfires spread through many national parks. Hazards in burned areas include, falling trees and tree limbs, unstable slopes, burned out stump holes and bridges or other structures that may be damaged. Whenever you are exploring a burned area you should stay on the trail and inspect any structure before you walk in, or on it. Wildlife – Approaching, or feeding wildlife is dangerous, especially so during the winter when most of these animals are hungry and stressed. Snow and Ice Fields – Stay back from snowy slopes and cornices, not only is the risk of falling higher, the risk of causing an avalanche is also increased. Avalanches – Avalanches are a part of being in the mountains, but the risk is especially increased after a heavy snow, or during wind storms. Avoid skiing or snowshoeing on unforested slopes, on gullies, or under overhangs. It is a good idea to educate yourself on avalanche safety and survival. Streams, lakes and waterfalls – As beautiful and tempting as frozen water can be, it can also be deadly. You should keep your distance unless accompanied by a guide who says otherwise. In winter ice near inlets, outlets and fast moving water is thin. Aside from the natural hazards you’ll need to avoid, there are also cold weather hazards. You can prevent these by following some general guidelines, being cautious and listening to your own body. Hypothermia happens when the body’s core temperature falls too low and it is deadly. It does not need to be freezing outside for hypothermia to occur, it can happen at any temperature below 50 F degrees if clothing becomes wet, or you are submerged in cold water. Avoid falling victim to hypothermia by dressing warmly and staying dry. Frostbite occurs when the air temperature is below 32 F degrees. Because it is brought on by freezing, it can’t happen until the skin falls below its freezing point. Frostbite commonly occurs in exposed skin and extremities, such as your fingers, toes, face and ears. Frostbite can be brought on and accelerated by having wet clothing, gloves, or shoes. To prevent frostbite you should wear protective clothing designed for cold weather. Staying warm is the key to avoiding hypothermia, or frostbite. 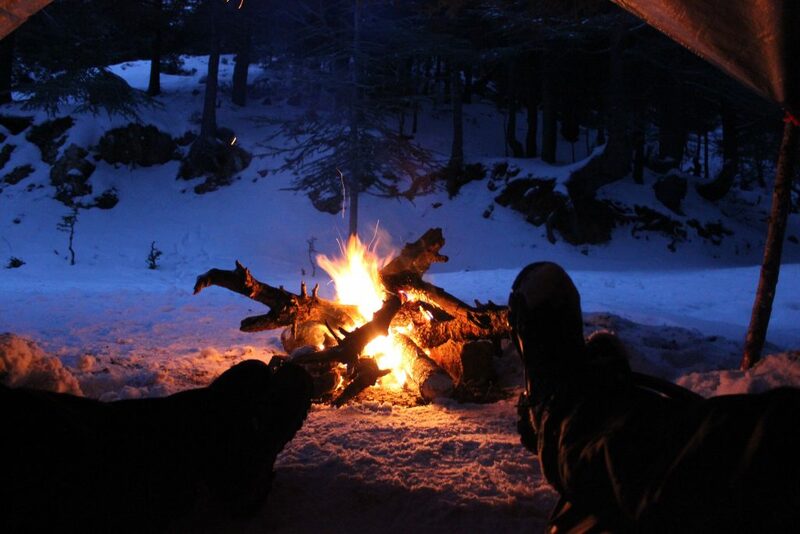 There are several ways to stay warm and sleep comfortably while snow camping. Some of these include common sense measures and other snow camping tips you may not know about. Use a 4 season tent – Despite the name 4 season tents are usually only used in the winter. These tents are designed to be windproof and able to withstand heavy snowfall. They have rigid exoskeletons that prevent them from sagging under the weight of snow. They are also usually equipped with superior ventilation. Ventilation is important, especially in the winter when your breath will cause moisture to cling to and then freeze on the interior of the tent. Once your body heats thaws this frost layer the inside of your tent becomes wet, along with your gear. Know how you sleep – Some people sleep hot, while others sleep cold. Knowing how you sleep can help you decide on a sleeping bag that will keep you warm, but also comfortable. Are you the kind of person who sleeps with a fan on year round and use a light blanket even when it’s chilly? If so you sleep hot and will probably find that a heavy sleeping bag is too warm. Being too warm will cause you to sweat and being damp and cold in cold weather is never a good idea. On the other hand, if you’re the kind of person who sleeps with a heavy blanket year round, you will probably want to invest in a sleeping bag that is rated for the coldest temperatures. Use hand and foot warmers – These convenient little heat packs can be placed inside your boots and gloves to keep you warm and keep frostbite far away. Avoid layering up while you sleep – If you’re cold it seems like common sense to put on more clothing, but this is counter productive in sleeping bags. Sleeping bags are designed to trap your body heat and use it as a continuous heat source to keep you warm. If you layer up, less body heat will make it out into the sleeping bag. Use a hot water bottle – Before you extinguish your fire for the night, boil water for a hot water bottle. The bottle will keep you warm inside your sleeping bag and by the time it cools off you will be warm and asleep. If you’re cold, go pee – This probably doesn’t make sense at first, but when your bladder is full your body is expending more energy than it needs to, in order to keep your pee warm too. Once you empty your bladder your body can focus that energy elsewhere. Eat – Our bodies are naturally warmer while digesting food. This especially true of foods high in protein and foods high in fat. If you are cold, eat. Put extra padding under your sleeping pad – Increasing the distance between you and the ground is a sure way to get a little bit warmer. Why not check out our article on wild camping survival gear here. There are two popular methods of cooking during snow camping. 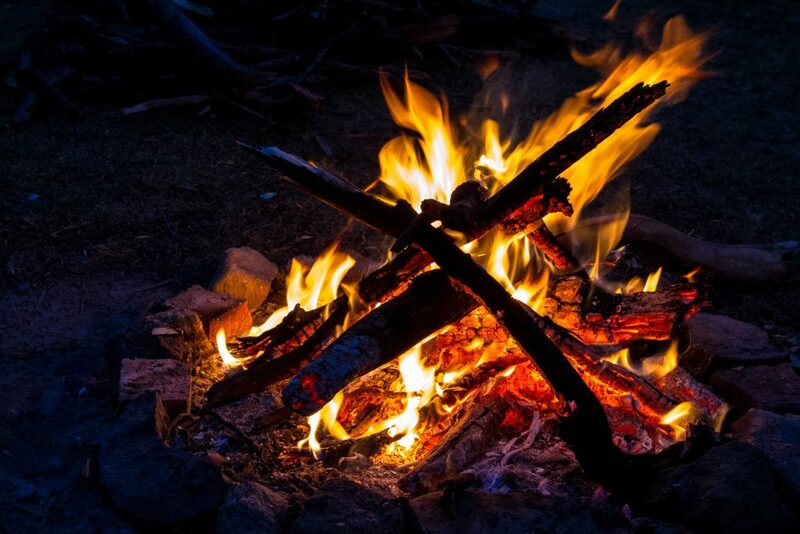 The first method, using a campfire has been around longer than modern man. However, digging a depression, finding dry wood and getting a fire lit in windy, snowy conditions can be a challenge. If you’re up for that challenge, a fire will provide a hot meal and it will warm you up in the process. The second method is using a camping stove. These propane fueled, open flame stoves usually have two burners and it’s much like using a gas stove in your own kitchen. They won’t throw much heat your way while you cook, but they are quick, effective and you won’t have to find firewood. With the proper ventilation and ceiling height, you could even use a camping stove in your tent. Of course, be careful not to melt, or set your tent on fire and ventilation is a must. While snow camping you’ll want to focus your meals around protein and fats. These foods are more filling, and your body digests them at a high metabolic temperature, which means you’re warmer after you eat. Meals consisting of meat, peanut butter, fish, nuts and beans are all good ideas. Avoid sugary foods, or junk foods as these common snacks often leave you hungry again in a short amount of time. They can be good for a quick energy boost, but the boost is followed rather quickly by a crash. Each individual will ultimately have their own personal itinerary of what they consider essential and what they don’t need, but there are some basics that every person should take snow camping, in addition to their clothing, tent and sleeping bag. These lists only cover the bare minimum of what you should have on hand, before you set off to go snow camping. Repair materials – Duct tape, as well as stove and mattress repair. Sanitary items – including toilet paper and a trowel to bury your business. An Itinerary – A note of your trip, including your general locations ( where you plan to be on which day) and how many days you will be away should be left with a trusted friend, or family member. You should also leave a copy of this note inside your vehicle. This is to ensure that if something goes wrong, someone knows where you are and will come looking for you. We hear and read about them all the time, brave adventures who dare to climb the world’s highest mountains, or trek across its most remote and unforgiving terrains. Often we envy those people, not necessarily for their gruelling journey, but for their sense of adventure, their excitement and their chance to see things in person, that we probably never will. 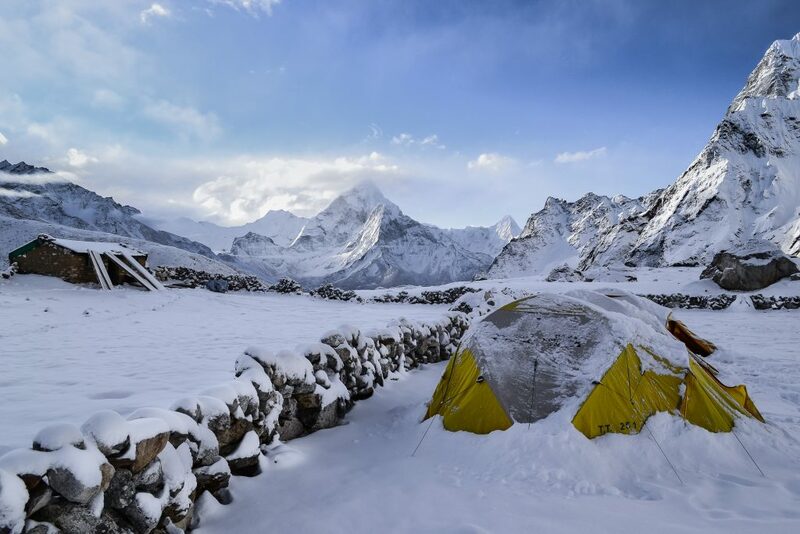 There are a few kinds of snow camping most notably mountaineering, polar challenges and survival challenges. Each one is similar to the next in most aspects. 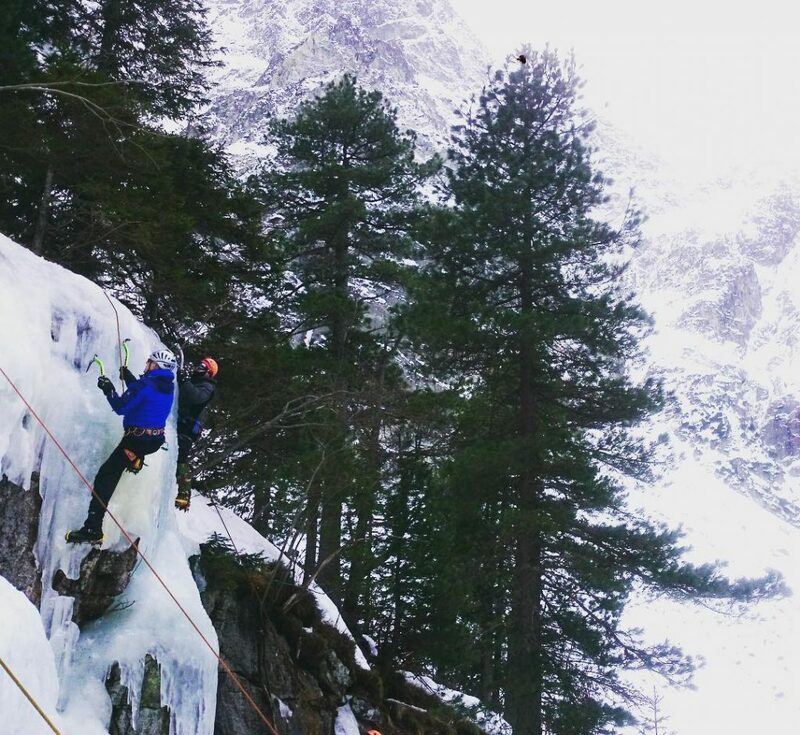 This isn’t just snow camping, it’s the sport of climbing a mountain. Mountaineering is usually done in large groups of people who are experienced climbers. Some guides offer mountaineering expeditions to amateurs, but this is rarely, if ever during the winter. Climbing mountains at any time of year is a challenge, but things get particularly dangerous in the winter months, thanks to high winds, blizzards and heavy snow build up. If you are considering a mountaineering expedition, be sure to research it thoroughly. 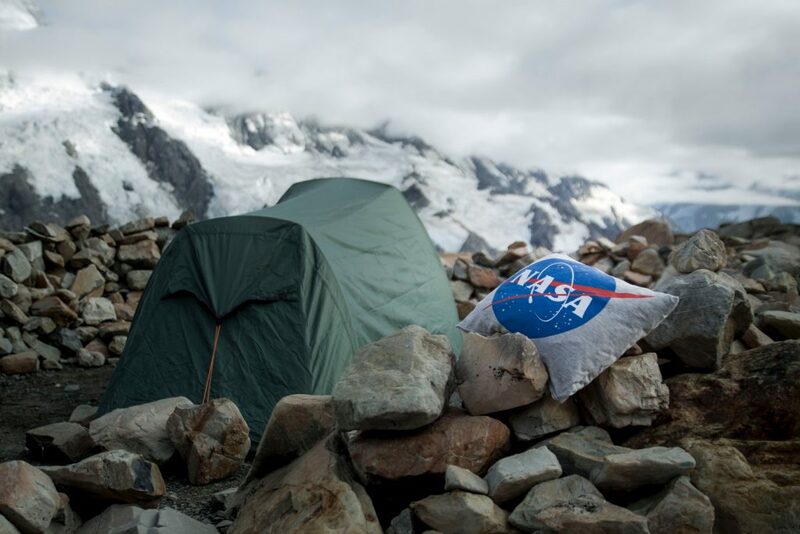 Be as educated as you can be, because this is one of the most unforgiving kinds of snow camping. It can be a lot of fun, but there are many variables. Polar challenges won’t have you climbing a mountain, but they will have you venturing to some really cold places. The first ever “Polar Challenge” was a 650 km team race that took place in the arctic. Now, it is considered an Extreme Sport and these challenges are held by different organizations and vary in terms of events and locations. Why not check out Bear Grylls polar survival skills book on Amazon here. Unlike mountaineering and polar challenges, survival challenges are a lot less deadly, despite the name. As long as you’re participating in this event through an organization and not on your own that is. Survival challenges are hosted by many different organizations and usually consist of sending the competitors off into the woods, in the middle of winter with minimal gear to survive. You’re not on your own though. Instructors will be nearby albeit a lot more comfortable than you, but if anything starts to go wrong, you will be promptly saved. In terms of winter expeditions, survival challenges are the most tame and may not require all of these snow camping tips. Happy snow camping! Did you enjoy reading this article on snow camping tips? Did it help? If so why not help us out and share it? Thank you and come back and visit us soon!